I don’t know about you guys, but lately with the nicer weather I’ve been trying to get out of turning my oven on so much (although I also just started that cake baking series, so take me with a grain of salt). When planning the weekly dinner menu, I’ve been gravitating toward recipes that don’t need to be baked, which means cooking more with the stove top and BBQ. It just seems kind of counterproductive to me to run the air conditioner all day and then have the oven on all night. You know what I mean? Anyway, I have seen variations of quinoa casseroles for a long time now and wanted to try one recently, but all of the ones I saw were baked. I really wanted to satisfy my craving without the oven, so I decided to try and make a stove top version. Um, I don’t even feel the need to try baking this because it was so stupidly good and easy. And no meat! I’ve been trying to cut the meat from a supper or two each week and I definitely didn’t miss it here (and neither did my Main Taste Tester, who is really the meat loving one in the equation). 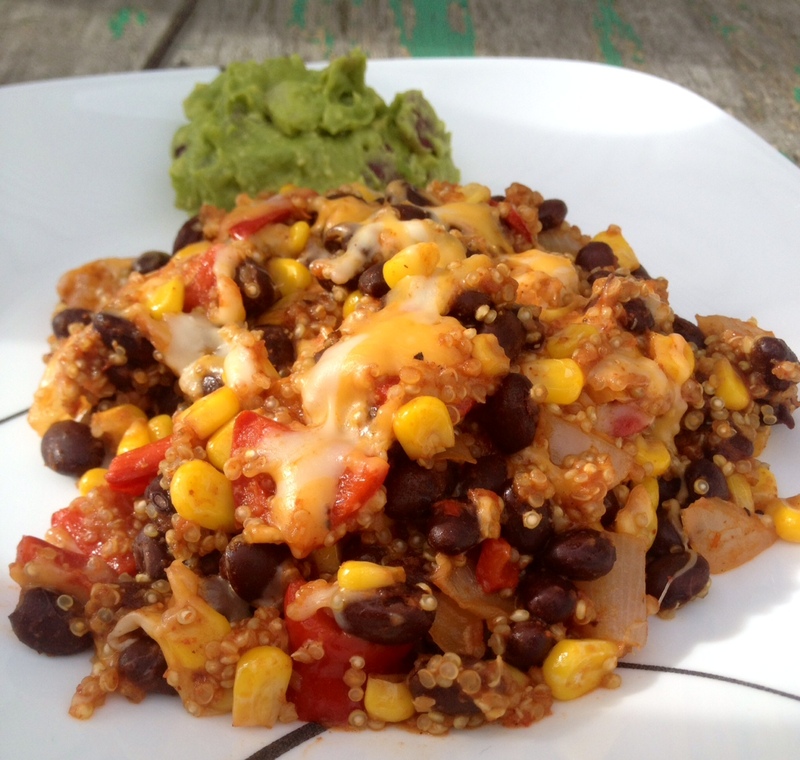 The quinoa and beans make it hearty with plenty of protein and you get a good dose of veggies here too. I’m obsessed with guacamole so I whipped up a batch to pile on the side. Don’t skip the guacamole. It takes it to a whole new level. Put the broth and quinoa in a small pot on your stove top. Bring to a boil and the turn down to low heat. Cook for about 15 minutes or until the white circle is visible around the edge of each grain. While the quinoa cooks, heat the oil in a large skillet over medium heat. Add the onion, garlic and pepper. Saute for several minutes or until veggies are tender and fragrant. Stir in taco seasoning and crushed tomatoes, cooking another minute or two. 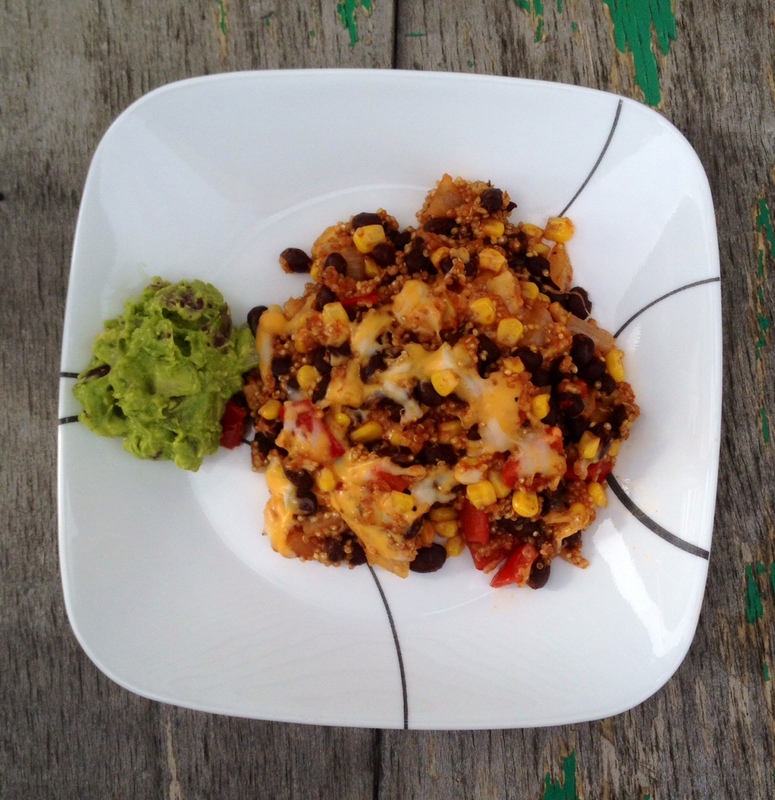 Add the cooked quinoa, corn and black beans to the skillet and stir everything together until heated through. Taste and add a little salt if desired. Turn heat to low and cover quinoa mixture evenly with shredded cheese. Cover skillet with a lid until cheese melts (about 5-7 minutes). While the cheese is melting, mash avocados in a small bowl and stir in the other ingredients. Serve the quinoa mixture with a scoop of guacamole.